Guest Chef Gordon Ramsay - Infusing the cream and milk with fennel gives an intriguing twist to a classic pudding. Preheat the oven to 140C/gas 1. Reheat the cream mixture. Meanwhile, beat the egg yolks, 60g sugar and the vanilla extract in a bowl with a wooden spoon until evenly blended. Stir the honey into the hot cream and milk; trickle this onto the egg mixture, beating constantly, until well combined. Strain the mixture through a fine sieve into a large jug, discarding the fennel seeds, then pour into the gratin dish or divide between the ramekins. Pour just-boiled water into the roasting tray to come halfway up the side of the dish or ramekins. Bake for about 20–25 minutes, until lightly set – to test, gently shake the dish or ramekins. Remove from the tray and cool completely. Chill until ready to serve. 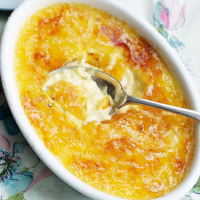 For the brûlée topping, sprinkle the remaining 30g sugar over the custard, then wave a cooks’ blowtorch over the surface until the sugar has caramelised.